Styled with a contrasting matt and polished stainless steel bracelet and case, this elegant men's timepiece by Sekonda features a deep blue dial with silver tone index markers, and day and date window at 3 o'clock. Water resistant to 50 metres. 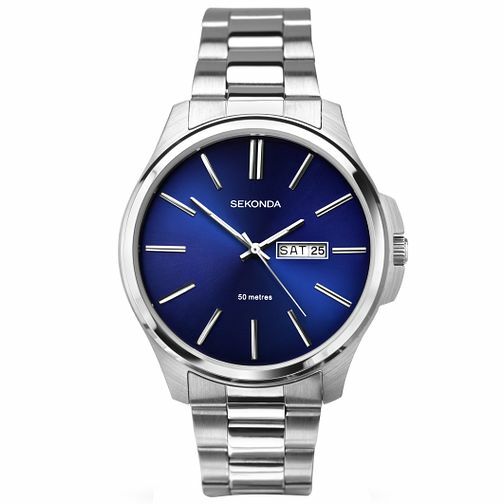 Sekonda Men's Blue Dial Stainless Steel Bracelet Watch is rated 4.9 out of 5 by 15. Rated 5 out of 5 by Anonymous from Looks great, at a great price Very happy with both the product and service I’ve received from H Samuel. Rated 5 out of 5 by Anonymous from Looks stylish Good looking watch, stylish but clear face. Nice stainless steel bracelet.